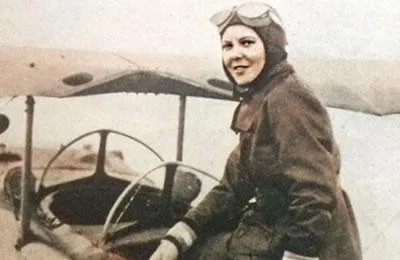 Sabiha Gökçen )March 22, 1913 –March 22, 2001) was a Turkish aviator. She was the first Turkish female combat pilot, aged 23. According to some sources she was also the world’s first female fighter pilot; however, others such as Marie Marvingt and Eugenie Mikhailovna Shakhovskaya both preceded her. She was one of the eight adopted children of Mustafa Kemal Atatürk. Atatürk attached great importance to aviation and for that purpose oversaw the foundation of the Turkish Aeronautical Association in 1925. He took Sabiha along with him to the opening ceremony. During the airshow of gliders and parachutists invited from foreign countries, she got very excited. As Atatürk asked her whether she would also want to become a skydiver, she nodded “yes indeed, I am ready right now”. Atatürk instructed the head of the school, to enroll her as the first female trainee. She was meant to become a skydiver, but she was much more interested in flying, so she received her pilot’s license. As girls were not being accepted by the War College in Turkey in those years, Sabiha Gökçen was provided, on Atatürk’s orders, with a personalized uniform, and attended a special education program. After receiving her flight patents (diploma) she trained to become a war pilot at the 1st Airplane Regiment. She improved her skills by flying bomber and fighter planes at the 1st Aircraft. In that same year, she took part in the military operation and became the first Turkish female air force combat pilot. Throughout her career in the Turkish Air Force, Gökçen flew 22 different types of aircraft for more than 8,000 hours, 32 hours of which were active combat and bombardment missions.